Adventures in Decorating: Thank You Country Sampler Magazine! Thank You Country Sampler Magazine! For as far back as I can remember, I've purchased Country Sampler Magazine, especially this time of year. Their issues always have beautiful and creative decorating ideas! Never in a MILLION years, did I think that our home would grace one of its pages! 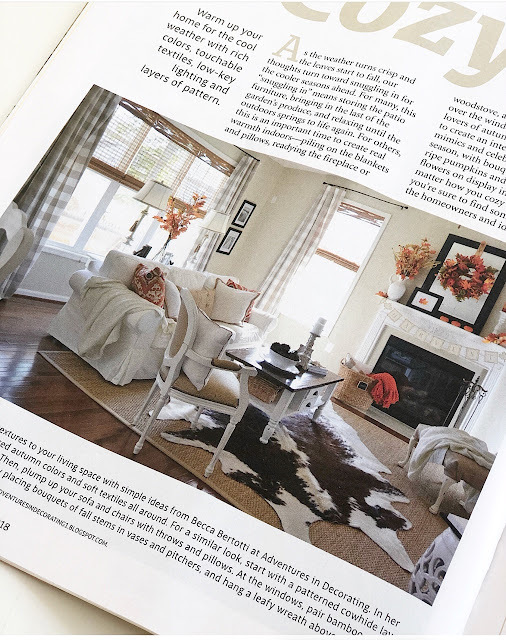 I'm truly thrilled to be a part of the "Cozy Up" article in their special "Autumn Decorating" issue! I hope you'll take a peek at the magazine, which is on stands now ... lots of beautiful and fun Fall decorating ideas! this post was great. I do not know who you are but certainly you are going to a famous blogger if you are not already ;) Cheers!